Is my local vape shop selling safe e-liquid? I’ve lost track of the amount of times in a debate on whether an e-cigarette is better for you than smoking, that the “but you don’t know what’s in e-liquid” argument gets thrown in the ring. This is equatable to picking up a lasagne from your local supermarket and putting it down because you just don’t know what’s in it. Of course you do, the ingredients are written clearly on the side. E-liquids are absolutely no different, be it from a vape shop near you, online vape shop or an e-liquid membership service like Vapura. Whilst a ready made lasagna might contain 20+ different ingredients of quantities known and unknown, every e-liquid bottle on shelves across Europe contain just four ingredients, all of which the exact amounts are clearly displayed. These 4 ingredients are propylene glycol (PG), vegetable glycerin (VG), flavouring and depending on whether the e-juice is nicotine-free or not, Nicotine. These four ingredients are at minimum food grade but typically pharmaceutical grade purity, so that you know exactly what you’re consuming. I’m going to break down all the ingredients and why they are necessary when it comes to safe vaping. An organic compound that is used as a solvent to bind the nicotine. In it’s purest form PG is an odourless solvent with a slightly sweet taste. Having been synthesized for over a century, PG has 100’s of uses including a food additive for ice cream as well as as a solvent in oral medicinal inhalers for over 50 years. In terms of characteristics PG gives a less volumous cloud than VG but more of a throat feel. With over 100 years of usage, PG has not been classified as being in anyway carcinogenic. A vegetable derived (usually soy bean) sweet and non-toxic solvent. Used in a huge range of applications such as cookies to mouth washes. It has been used as a food and pharmaceutical additive since the 1930’s with no carcinogenic or toxic link since this time. All flavourings used in e-liquids are the same that you’d find in your foods so are all deemed safe for human consumption. On top of this, the concentrations of flavourings in the overall e-liquid are relatively low, typically between 2-10%. Most of the time the flavourings are derived from organic sources such as fruit and mint leaf. Nicotine is highly addictive and although it has been linked to increased alertness and fine motor skill improvements, it really offers little in the way of physical or mental benefits to offset the addictive nature of it. On the other hand, Nicotine is non-carcinogenic and in low concentrations, non-toxic. At Vapura we never endorse using a nicotine based product for the first time, but we can say that any e-liquids you purchase from a reputable retailer in Europe contain only pharmaceutical grade nicotine. In July 2017 the Tobacco Product Directive came into force in Ireland and EU wide. This is a multi layered directive aimed at protecting both e-cigarette users and non-users. Although many would debate some unnecessary elements of the directive such as bottle size and atomizer size restrictions, at the core there is some crucial legislation. Before a newly released flavour by an e-liquid manufacturer is allowed to be put on a retailers shelf, it undergoes an extremely expensive and thorough independent lab testing that gets EU certified before it can be sold. This includes toxicology testing as well as screening of ingredients that are not safe for human consumption. Then it is subject to a 6 month delay period before retail is allowed in case anything was missed during testing. Not only that, but every bottle has to be traceable from shelf to manufacturers specific batch creation. No food testing goes under testing as expensive or stringent than simple, four ingredient e-liquids do. 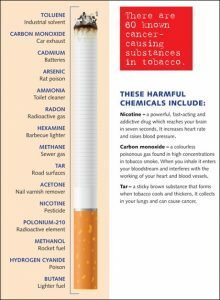 Despite their known health implications, cigarettes are not subject to the same mandatory testing that e-juices are, which is crazy considering they contain the following chemicals,but not limited to, when combusted. Nicotine, Tar, Carbon Monoxide, Arsenic, Ammonia, Acetone, Toluene, Methylamine, Pesticides, Polonium 210, Methanol. The above is just one of the reasons why Public Health England have stated e-cigarettes are 95% less harmful to you then smoking. Most importantly of all, the majority of the carcinogenic compounds released when smoking are attributed to the combustion process. E-cigarettes have no combustion phase which is the key difference between them and smoking a cigarette. So when you see a bottle of e-liquid, don’t be so quick to judge. There is a bigger variety of chemicals in the bottle of water you drank today than that bottle of e-juice. Plus, you can trace that bottle of e-liquid to an exact place and time that it was manufactured. Very few products you see day to day carry more purchaser reassurance than that.